Have you been in a recent car crash, fender bender, or motor vehicle collision? 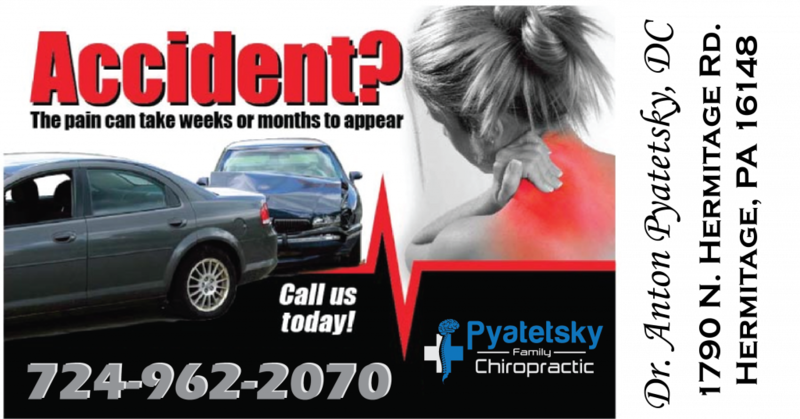 At Pyatetsky Family Chiropractic, we have had a lot of success with treating car accident patients. According to the research conducted by the Research Council, nearly 33% of all people injured in motor vehicle accidents (MVA’s) sought treatment from a Chiropractic Physician. This is a great number given that the National Safety Council (NSC) determined that there are more than 12 million MVA’s a year involving more than 20 million vehicles. The reason individuals like you choose chiropractic care for treatment of injuries sustained in MVA’s is simple – chiropractic care is exceptional in the treatment of soft tissue injuries, especially of the spine! The most common injuries associated with car crashes are sprains and strains, known as whiplash, of the spinal muscles and ligaments; it’s only natural that chiropractic be your first choice of treatment for the injuries you have sustained. Many studies have found individuals injured in MVA’s prefer chiropractic care for the treatment of their injuries. One such study evaluated 190 whiplash injury victims and found those who received chiropractic care reported treatment satisfaction of 100%. If you are injured the insurance company may even owe you money from missed work, pain and suffering and mileage to and from appointments. About 3 million car accidents victims are inflicted with whiplash and 1/3 of these result in chronic pain. 93% of people suffering form whiplash improve with chiropractic care. About 75% of car accident injuries occur below 12 mph. Whiplash injuries may take 5-6 months to stabilize. Just like a broken nose, if your spine heals wrong it will never be the same. There is no relationship between car damage and a person’s pain. Pain can be present without car damage. WHO PAYS THE BILL ? The majority of all car insurance policies provide personal injury protection (PIP) benefits. You are entitled to these benefits no matter who is at fault. Your insurance will pay for care that is medically necessary and most of the policies limit your medical care up to 15,000 and up to a year after an accident. This includes Chiropractors.